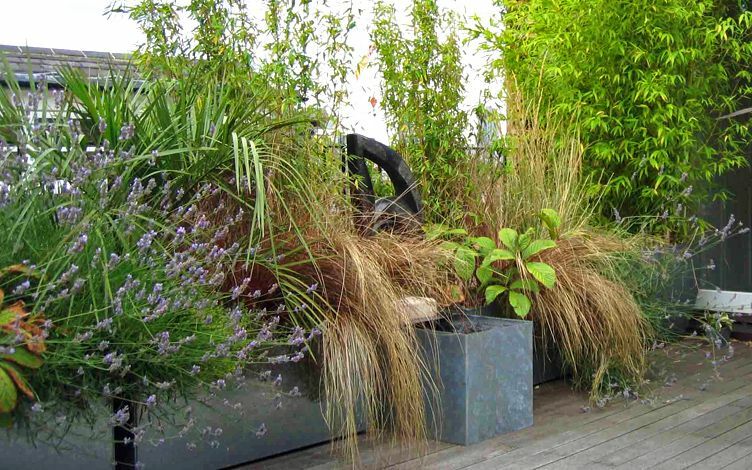 This concise anthology of roof garden projects delineates our broad spectrum of London schemes and its progressive design philosophy. 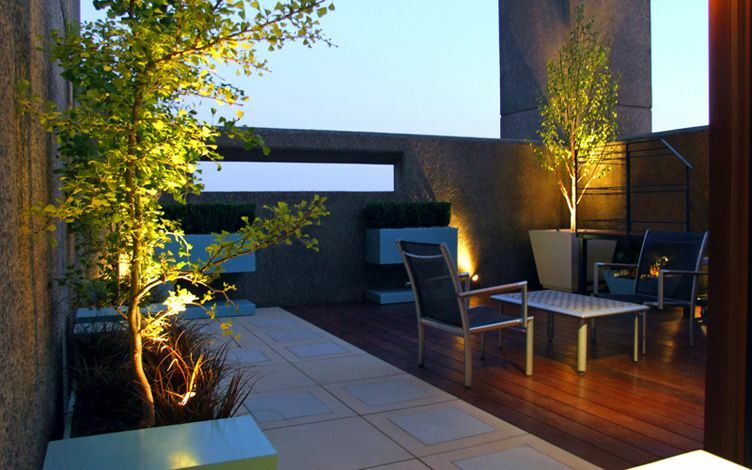 The metropolitan locations, diverse clienteles and wide-ranging site sizes define a thoroughly unique scope. 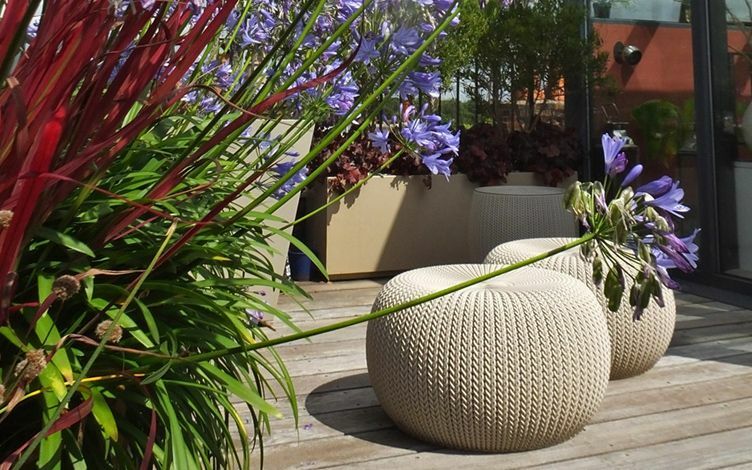 From pocket-sized Highgate rooftops to medium-sized Paddington terraces and vast Canary Wharf roof gardens, the capital's altitudinous landscapes express matchless outdoor experiences. 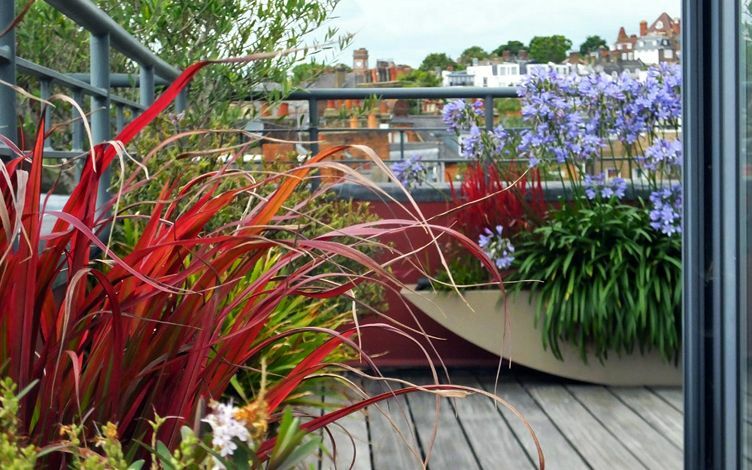 With photographs taken by our clients, we guide you through inspiring selected highlights in the contemporary canon of one of London's most established roof garden designers. 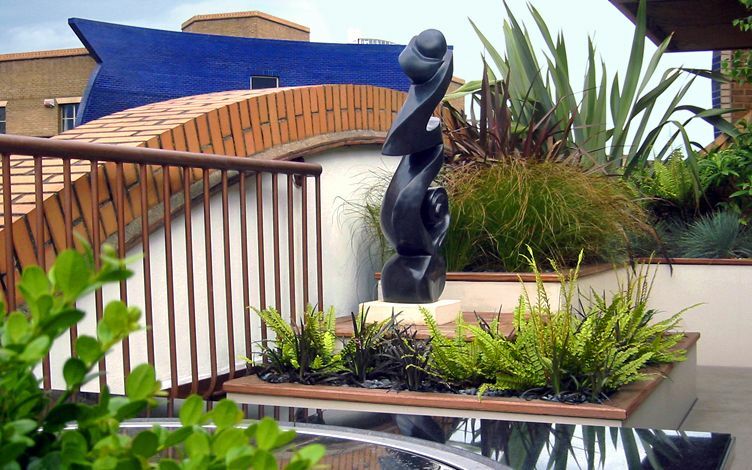 Perched high above North London's undulating topography, the south-facing roof terraces of Hampstead and Highgate present not only prime city panoramas, but also balmy conditions for cultivating rooftop floras which withstand windy environments effortlessly, and convey naturalistic Mediterranean nuances. 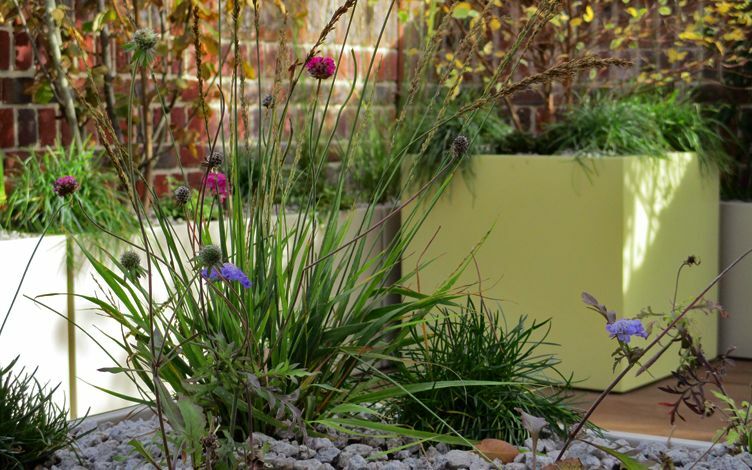 In this Hampstead Village rooftop garden, we planted an array of Strawberry and Pine trees to produce a sturdy framework, and sustain a soft understorey of Cogon grasses, blue Agapanthus, Sea thrift and wildlife-friendly shrubs. 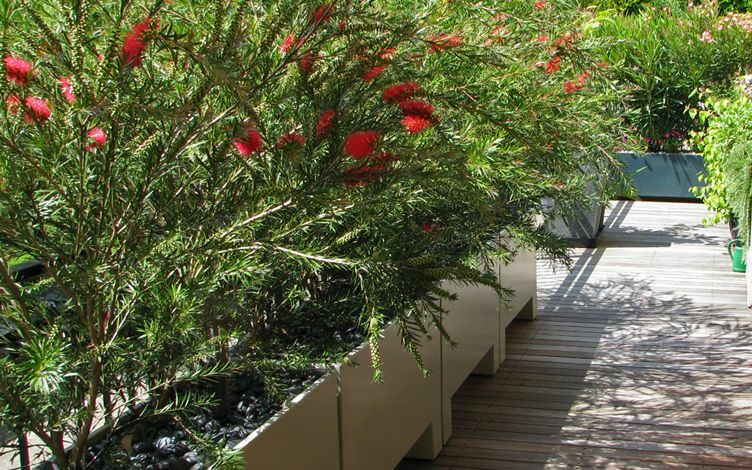 In Highgate's Shepherds Hill, an evergreen Callistemon hedge generates bright red bottlebrush blooms along a linear roof garden, and forms a privacy screen towards nearby buildings, while sheltering clusters of Oleanders, herbs, alpines and sprawling South African flora. 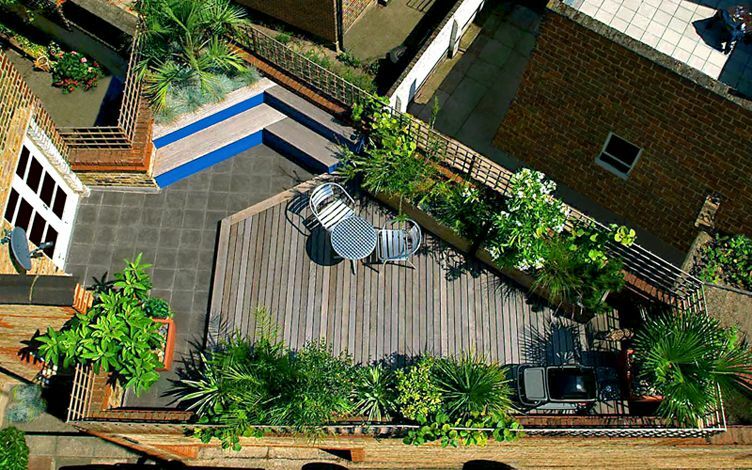 Islington's roof gardens benefit from one of London's most diverse urban settings, represented in a gamut of high-rise developments, quaint terraced houses and canal-side penthouse roof gardens. 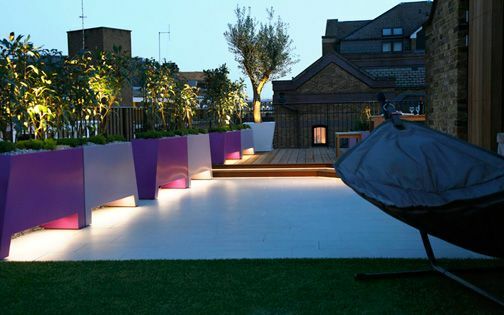 In Upper Street, tucked away behind a busy turning, this small roof garden presented a lacklustre exterior – remnant of a developer's last-minute landscaping effort. 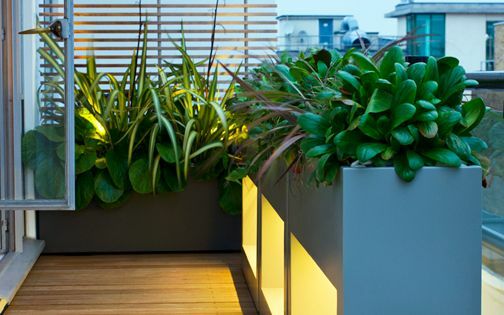 While given an existing deck, we focused on articulating a naturalistic soft landscape, interspersed with a custom-built water feature, sculpture and outdoor lighting. 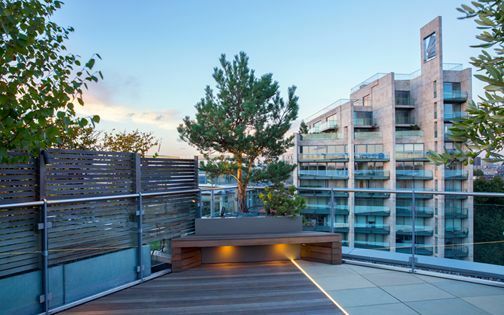 Contrastingly, Crystal Wharf's penthouse apartments, along City Road Basin on Regent's Canal, convey minimalist interiors and expansive glass facades, amid a multilayered urban landscape of waterways and picturesque rooftops under a sleek city skyline. 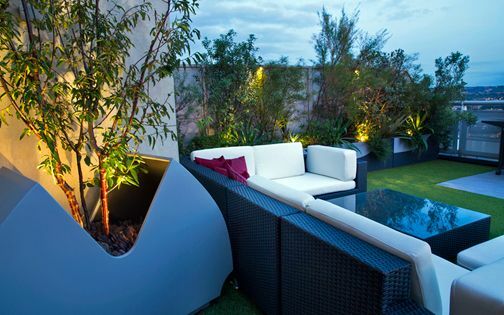 At the development's edge, nestled by the canal, this roof garden envelops a contemporary residence, defining a contrastive terrace design which embraces its genius loci via aperture planters, native Irises and Box topiaries – juxtaposed alongside sculptural Mediterranean tree silhouettes. 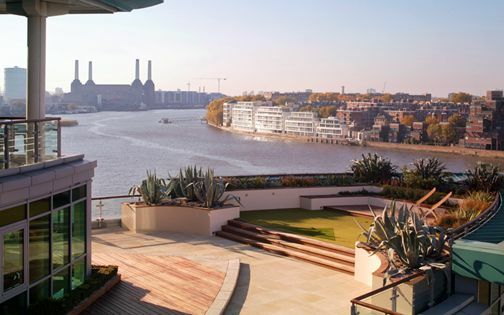 Bermondsey and Battersea, along their six miles stretch, exhibit unparalleled roof garden density in and around River Thames. 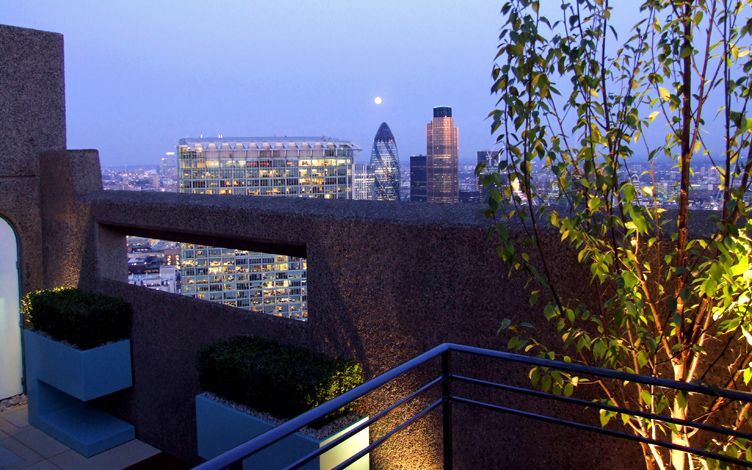 Both locations' skylines are distinguished by iconic landmarks, past and present, and interweave London's century-old modern architectural canvas. 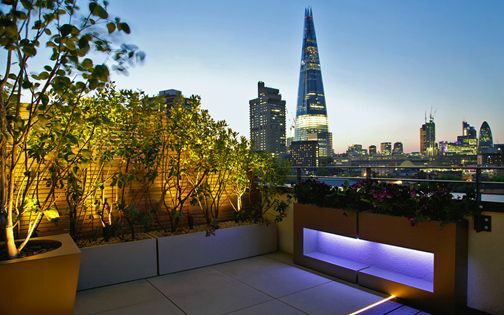 At Bermondsey Street's midpoint, with an up-close Shard vista, this 30-square-metre rooftop garden displays geometric forms reminiscent of its skyscraper backdrop. 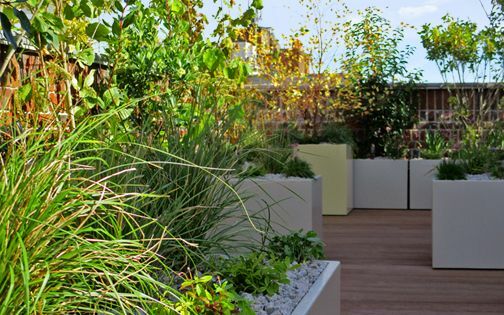 In Battersea, above a south-facing suntrap, a first-floor Mediterranean rooftop garden sustains a highly textured landscape within a triangular blueprint. 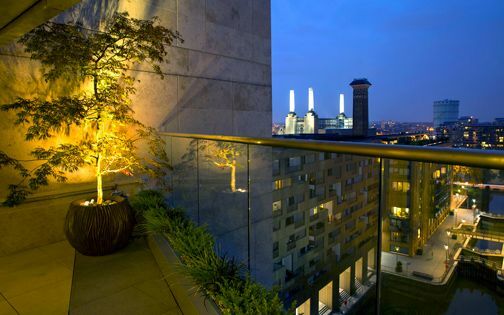 This unique outdoor space, at the foot of Battersea Power Station, was facilitated by reinforcing its substructure, while resting aloft a private parking garage. 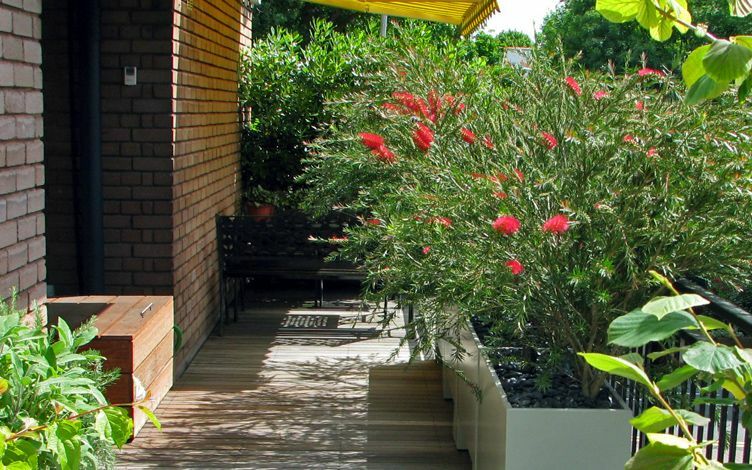 Sun-tolerant plant species soak up heat, and define a well-integrated design & build scheme in an intimate roof garden setting. 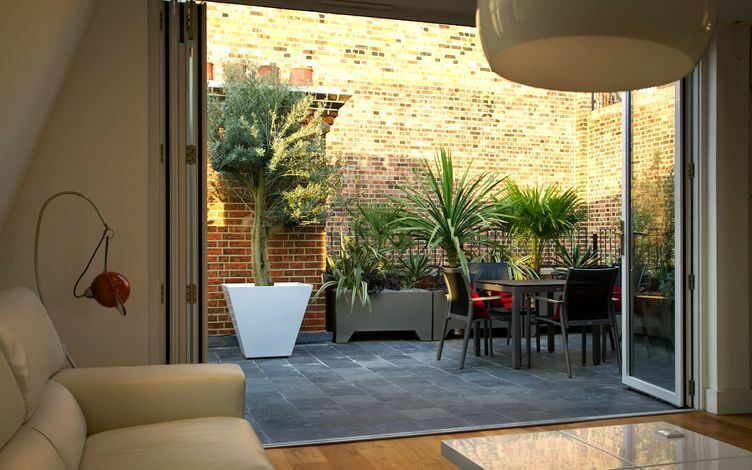 While you wouldn't necessarily associate Blackheath with panoramic roof gardens, the capital's skyscraper sprawl hasn't eluded this South-east London district. 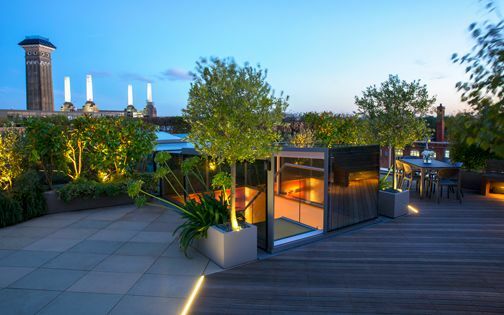 Yet, with a protected view of St Paul's Cathedral, The Point's low-rise vistas, right beside Blackheath Park, characterise a well-balanced rooftop milieu. 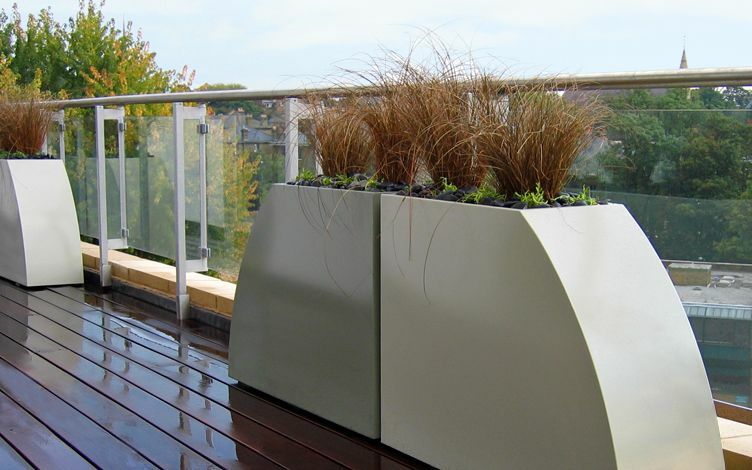 To convey our Scandinavian clients' penchant for innovative detail design, we created a series of curved planter duos to preserve expansive panoramas and construct eye-catching focal points. 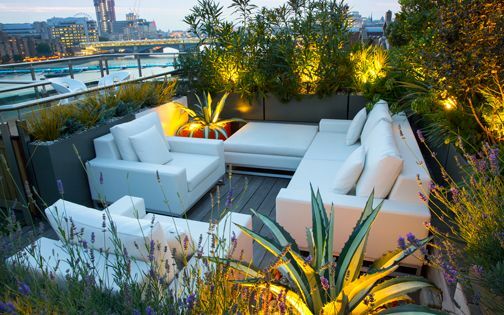 Travelling five miles westwards, along Shad Thames, a densely packed riverside hub demarcates London's inner sanctum of authentic roof garden culture. 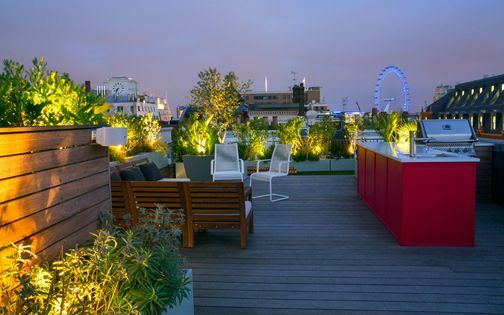 With thousands of rooftop terraces, Shad Thames lives and breathes river airstreams above its historic dockside, where we've designed and build dozens of rooftop garden projects. 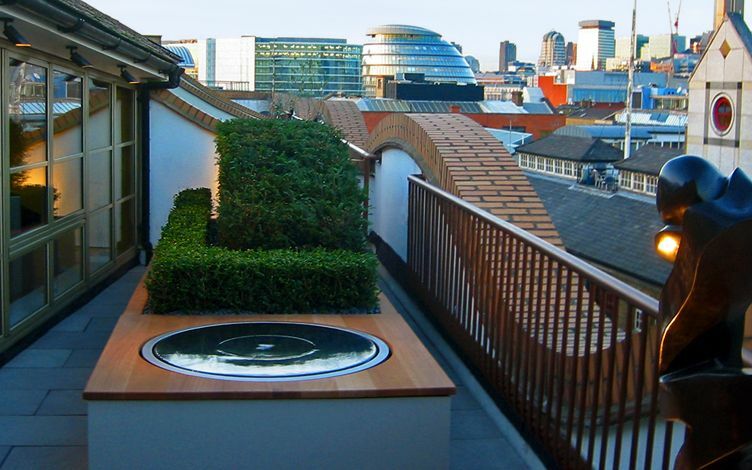 This tiny roof garden atop Piers Gough's The Circle in Queen Elizabeth Street displays a wholly streamlined minimalist Box and Yew green sculpture which merges with its building's wavy facade and City Hall backdrop. 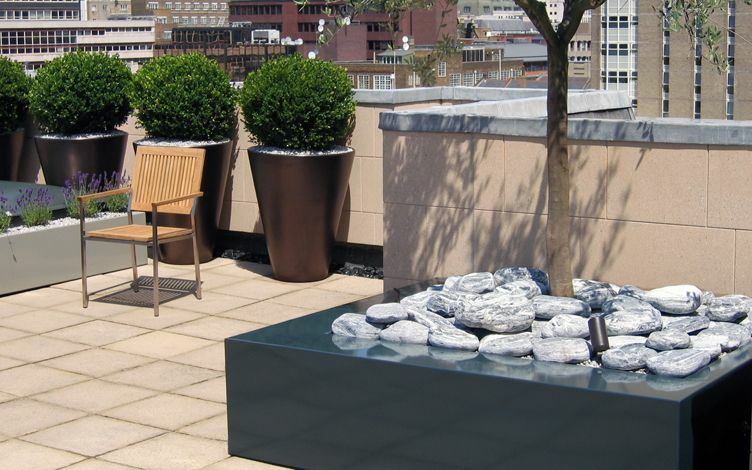 A stainless steel Echo water feature, custom-designed by the artist Simon Percival, creates mesmerising fluid undulations. 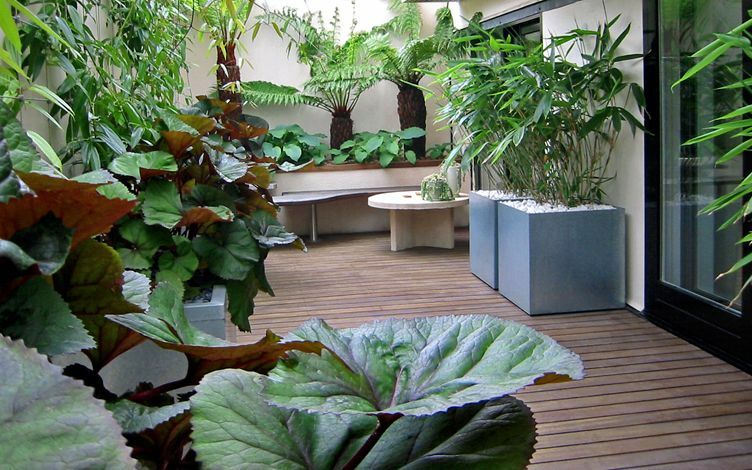 Similarly, though with a leafier approach, our Butlers Wharf penthouse roof garden only an earshot away showcases large-leaved plants in a sheltered rooftop courtyard, contrasted by a low-keyed layout. 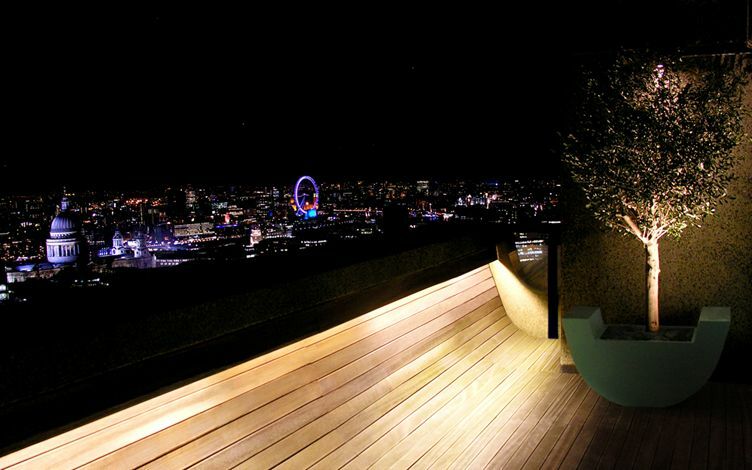 The breathtaking panoramic views from Cromwell Tower's 40th floor produce a definitive London skyline study, right at the city's centre. 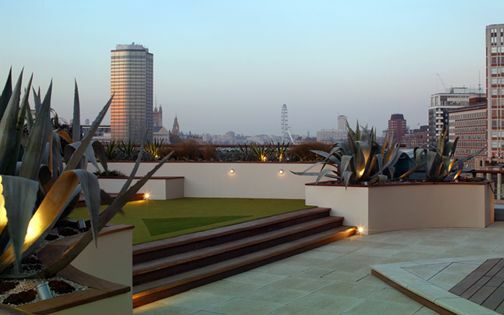 While summiting the tower's apex to design and build a Barbican roof terrace formed a gratifying, albeit complex logistic challenge, for our clients, a cheek-to-cheek daily caress with zenithal edifice maintains non-stop family entertainment. This surreal, modern-day Monopoly aerial pursuit enlists a 180-degree spectrum from O2's dome-shaped roof in its south, through St Paul's Cathedral centrally, across to London Eye and Battersea Power Station in the west. 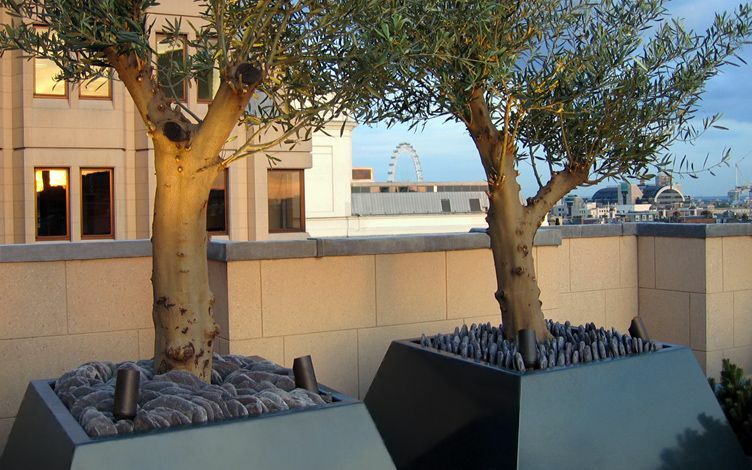 We designed bespoke aperture planter duos to echo the building's horizontal in-situ concrete openings, alongside a raised platform to engage in city views, augmented by curved planters which mimic the Barbican's cantilevered terraces and London Eye's apertural elevation. 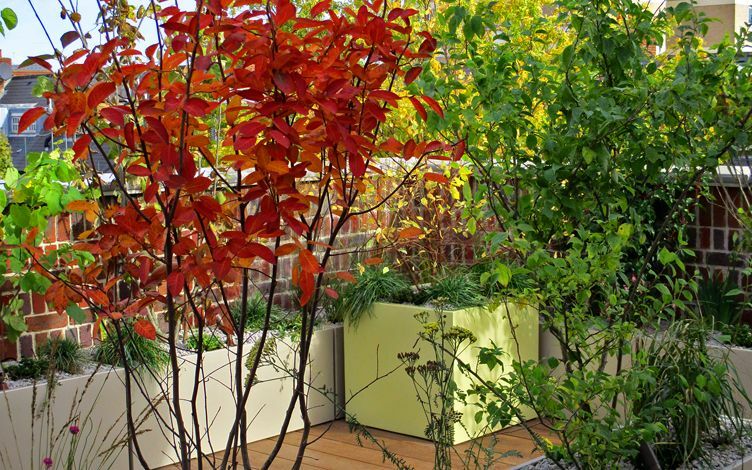 With pollution-tolerant Ginkgo trees and wind-resistant Chinese red birch cultivars, this trio of exclusively secluded lofty rooftop gardens softens the Barbican's solemn, brutalist architecture by infusing an entirely new roof terrace design ideology with colour and leafiness, nearly half-century since Cromwell Tower's inauguration. 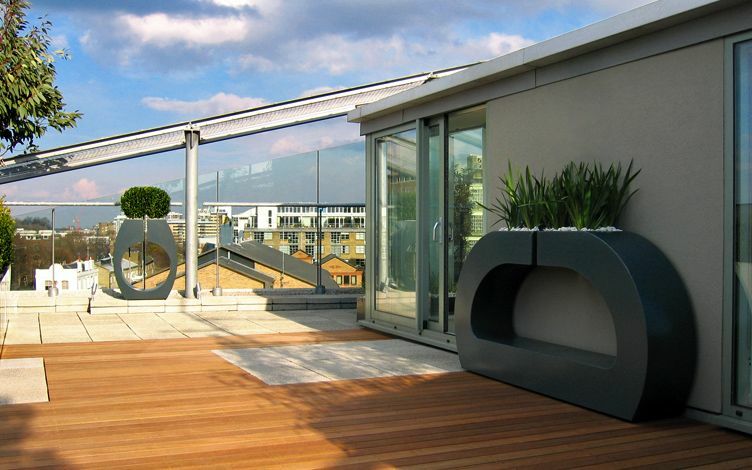 This trio of mid-rise roof terraces encompasses 3,000 square feet above Covent Garden's Long Acre, presenting eye-level panoramas over London, where Nelson's Column appears sky walking between Battersea Power Station's chimneys, amid Charing Cross Station's terraced roofline, London Eye, Centre Point and BT Tower which form distinct, prized aerial perspectives. 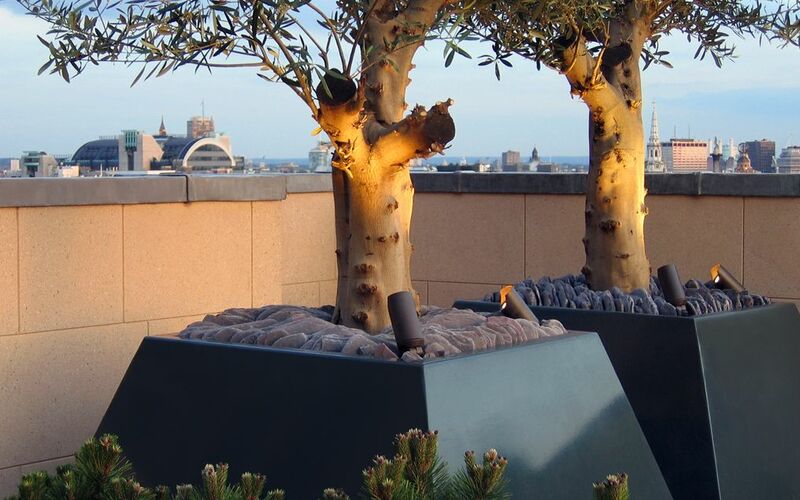 We planted a robust architectural palette of Olive, Palm and Silver birch trees, Box hedges and topiary spheres, Lavenders and Cape daisies to create structural, low upkeep, high foliar definition under an urban skyline backdrop. 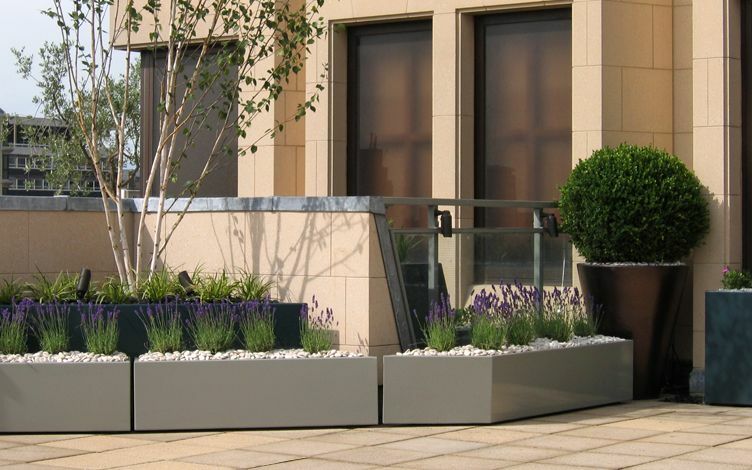 With a unique 70-degree roofline angle, we designed fifty fitted large-scale planters to match the building's geometry, and given ample vehicular access, we craned specimen trees, 2-metre-long containers and a wide range of mulch aggregates to complement the powder-coating finishes.